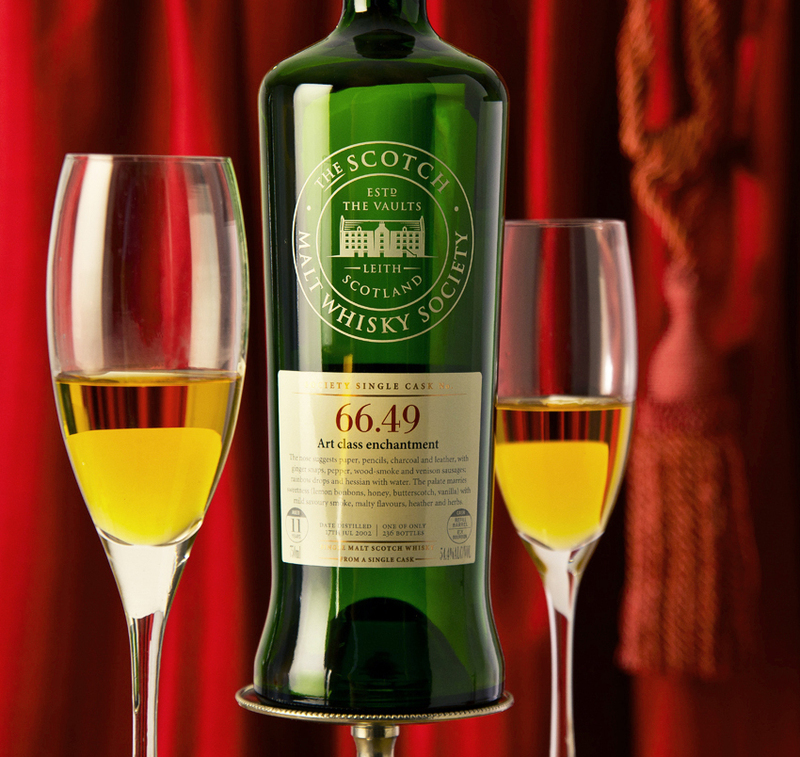 The Scotch Malt Whisky Society- Open the velvet curtains……..We’ve found the rarest of the rare. Welcome to the distiller’s dark art pinnacle of perfection. Batch 66.49 has been road tested by your faithful scribe and photographer and what a hellish job is was. For my adventure into the upper echelon of malted beverages I thought, what is the most snobbish vessel with which to taste the liquid gold ? Why champagne flutes of course, and the glass actually enhanced the experience. In addition to the hoity toity label and bottling , the stuff is cask strength , i.e. rocket fuel. So Tom and I proceed to taste it neat, and amazingly, not one bit of harshness or bite. The nose was thick with initial alcohol but that gave way to floral notes and just a bit toffy . The complexity in the mouth feel and the delishishly woody flavors were noticed by all lucky enough to be present . The color was a brassy orange and the palate had a nutty, slightly citrus flavor. This being one of only 236 bottles worldwide, the likelyhood of you sharing my experience is distant at best. If you ever are offered a dram, jump at the chance, it is truly world class. This one goes unrated due to its being unobtainium . But make no mistake, it’s the top of the heap. 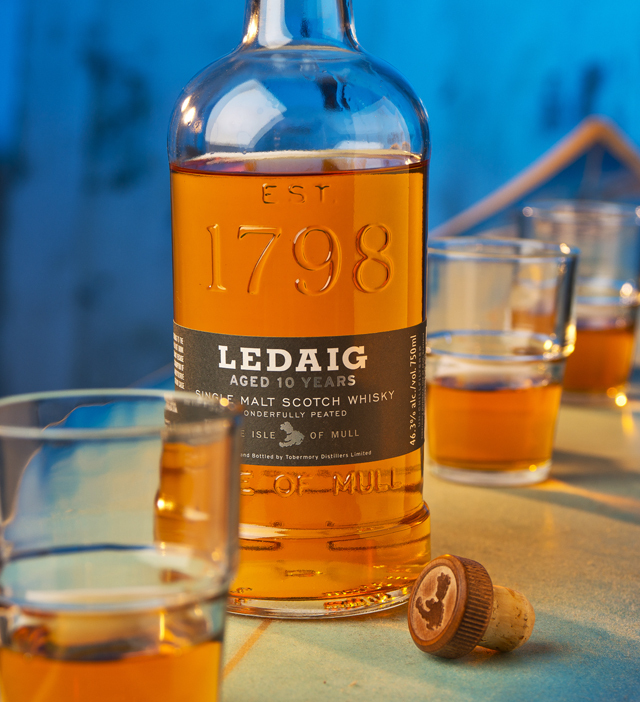 Ledaig 10- Let’s assume that you would like to combine your love of surfing and single malts. I have just the solution and place. Get your favorite board on the plane and head to the Isle of Mull off the western coast of Scotland where this distillery lies . Sequentially, it’s probably better to surf first and then head to the bar for a wee nip of this wonderfully peated malt. The seaside brininess and not so subtle smoke are the first things you will note in your glass . The bracing cold waves you just left will give way to a swell of warmth and vanilla creaminess after your first dram disappears. The palate is sweet and peppery at the same time and the peat smoke from the dried barley is ever-present. The finish is quite brief like a fast breaking wave……. Both of your endeavors involve flowing liquid energy and the latter will add new meaning to hanging 10. After your next set of waves, collect some drift wood and make a roaring beach fire , having this dude join your party makes it easy to go with the flow and rates a 7.5 .